During their stay in the mine larvae grow, forcing the mines to become wider and larger. In most cases the excrements remain in the mine, as characteristic grains or strings. Often also moulting and pupation takes place within the mine. In other cases the full grown larva makes an exit slit in the mine, and drops to the ground to pupate there. But is also happens that larvae live only part of their life as miners: in later stages they then may live “free”, generally under a folded leaf margin or lobe, fixed with silk, or less often in a spinning. Not only leaves are mined: quite a few species are specialised cortex miners, and sometimes even the skin of a fruit is mined. It is not difficult to imagine how this way of living may resemble that of larvae living ar borers in stems, roots, fruits, or the receptaculum of a flower. In general cortex miners and borers are not dealt with here. 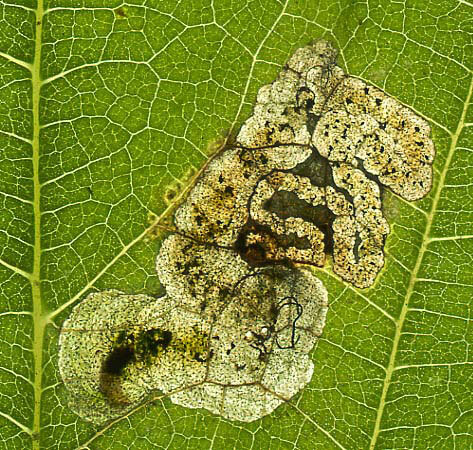 What remains are about 2500 European species of true leaf miners. The mine, with all its numerous details often is very characteristic of the insect that made it. Even after the larva has left, the mine remains as a trace of what lived there. The most important characters are the place of the mine in the leaf (upper-surface, lower-surface, or occupying the entire thicknes of the leaf, ‘full depth’), the shape of the mine (corridor, blotch, or first corridor, then blotch), and details of the excrements. The excrements of plant-eating insects almost always are fairly dry and hard dropping, containing much undigested material. For that reason they are referred to as “frass” in entomological literature.